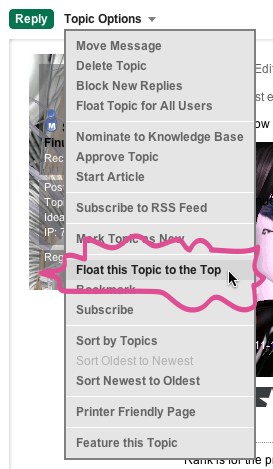 [GUIDE] Get the Most Out of community.secondlife.com Search! Ain't that convenient? Just about everywhere you go on community.secondlife.com, you'll see the familiar search box in the upper-right. One notable exception is directly under the Answers tab, because here, a simple search is contained within the "Ask a Question" widget to reduce confusion. But when viewing a particular Answers thread, your private messages, and more — there's the search box! Community participation — YES, YOU — helps good things float to the top. How? For example, if you ask a question in Answers and get a helpful answer, make sure to mark it with Accept as Solution. This highlights it so others who have the same question after you can see it easier. It should also rise up in search results. 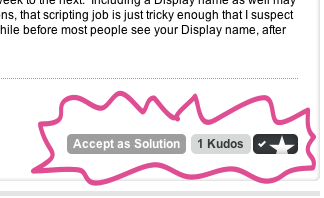 Also, if you're generally browsing Answers and see a helpful answer, click the Kudos button, available in certain places. It's an easy way to thank the answer-giver and help others focus on what's useful. Kudos are part of our ranking system, which makes it easier to see who extremely helpful Residents are. For more on where you can give Kudos — or revoking them if you made a mistake — see this Community Help page. In the search box's dropdown menu, select Users. Enter their name (or your closest guess) and wait for it to autocomplete, or click Search. Note: There's a weird bug. If you go back a page after viewing results and do another search, it may incorrectly show "0 matches". I've reported it. Starting your search with the simple mode should work fine for most, but if you regularly find yourself narrowing down options, you can bookmark the power search page. If you want to keep track of search results over time because there are keywords you're watching for — like a type of land you want to buy — then you can Subscribe to RSS Feed for this Search, too. If you're accustomed to Boolean operators and want even more options, click the Advanced Search... link to get super-granular. As we say here, the world's your prim oyster. 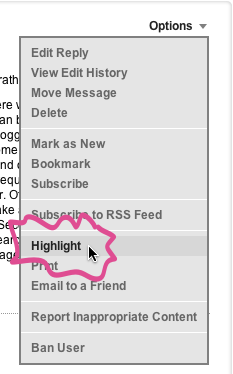 What does that "Highlight" thing do in the Forums? I asked community guru Lexie Linden and she clued me in: turns out it's the same as it's similar to "Permalink", which puts a specific URL for that post in your browser's address bar, which can be useful within a huge thread. UPDATE: As Cerise Sorbet clarifies in the comments: "The highlight function should literally highlight posts in a different background color, but the graphical backgrounds used here have been covering up the effect." Oh boy, we need to fix that! Of course, the name is confusing — I was expecting the post to glow or something. So I've made a request to rename Highlight to Permalink like we already use elsewhere on the site, like at the bottom of a blog comment. Just go to Google.com and search for "site:secondlife.com keyword", like "site:secondlife.com avatar" or "site:secondlife.com avatar attachments". If you want to limit it to a subdomain, try something like "site:community.secondlife.com avatar attachments". If you find yourself doing this frequently, you could create a Google Custom Search to save time. As those 80s NES days used to say: NOW YOU'RE PLAYING WITH POWER! For more info on how to search community.secondlife.com, see Community Help - Searching. Got a compelling search tip you wanna share? Let's hear it! Thank you Torley. I was wondering about that highlighting/Permalink thing. The highlight function puzzled me for a while. It turns out that it does do something here, but a flaw in the LL site design keeps us from seeing it. The highlight function should literally highlight posts in a different background color, but the graphical backgrounds used here have been covering up the effect. To see how highlighting works, you can try this in a user style sheet. This example uses a border instead of a background change, that's the easiest way demonstrate. It can be handy to keep your place in a long thread while paging around. For this site, only the first entry makes much of a difference. If works in the forum areas, it does not do much here in the blog area. @Cerise THANK YOU for that correction and clarification, I've updated the post and am going to forward that info to our community platform gurus. After you find a likely result, expand the listing by clicking on its title, then click on the <More Info> button. This will take you to the (I assume ...) leftover legacy search detail page, where you can view the individual items that are searchable on that parcel ... with a direct <go> button to the item. NICE!! Personally, I do this in an external browser where I have the added ability to use the page search function (generally Ctrl-F) that is not available in an internal browser.